I had a lot of fun making Cheryl’s (Meadow Mist Designs) Foothills Mystery Quilt last year. When she announced that she would be doing another mystery quilt starting in June, I knew I would participate. This year Cheryl is calling it the Midnight Mystery Quilt, and it would be so much fun if you joined us, too! On Thursday, the first set of instructions were released: Fabric Selection. If you are going to quilt along with the Midnight Mystery Quilt, let me know – I love to see how different fabric choices read in the same pattern and it is fun to have others to follow along with each month. Linking up to Sunday Stash. It might not be new fabric, but shopping my stash was so fun this week! Going to be out of this world Yvonne …..
Now this is going to be GREAT! That Rocket Blast in Navy is so YOU! Your fabrics are very pretty. Great fabric pull! I can’t wait to see how all these Midnight Mystery Quilts come together – it’s going to be so much fun! I love your choices. I shopped my stash, and so did my sister. Once she saw what I was doing she decided to play along as well. Those are perfect jetgirl fabrics and they are going to look awesome in the quilt! Even though I have already made one top with the pattern to test it, I am so inspired by everyone’s fabrics I think that I am going to start pulling fabrics for another one so I can quilt along with everyone. I’m really on the fence with this one. I’ve never participated in a mystery quilt challenge before and I tend to struggle when I KNOW what the pattern is. I’m on vacation now, but I’m hoping when I get back tomorrow evening and get my sewing room put back together (everything is being rearranged) – I hope to make a decision based on what fabrics I have on hand. 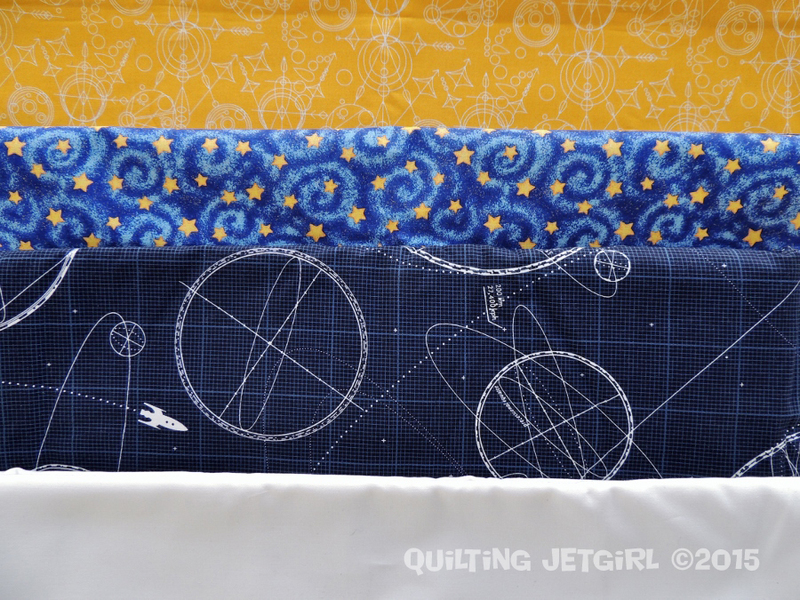 Love this fabric pull – it’s so perfectly jetgirl! I just signed up for this too. It will be my first mystery quilt. I’m already uneasy about the idea of a mystery quilt, but I’m trying to resist the “Un-Mystery” quilt button. Your fabrics are sure to make a bold, midnighty quilt. I was thinking of using some yellow too but haven’t decided what to pull in with it. Love that Rocket Blast fabric and you picked out great coordinates Yvonne! I’m stil figuring out which way I want to head but that is half the fun! Love these fabrics, especially together. And somehow they seem very appropriate for a ‘midnight’ mystery quilt.